Very hearty and next to no fat! I was looking for something healthy, yet inexpensive, for dinner the other night and remembered tortellini soup. It didn’t hurt that my memory was stirred by seeing the bag of dried tortellini I had picked up at the Bulk Bard and had forgotten about. Dried tortellini are great for the pantry. You can whip up a filling dinner in no time just by heating a sauce and grating some cheese, or as in this case, making soup. 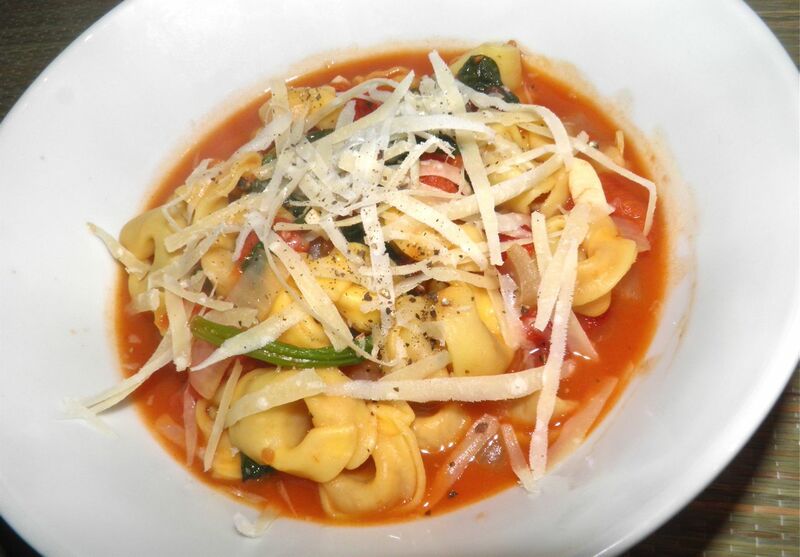 Tortellini soup is hearty stuff. I used dried tortellini in this recipe but fresh or frozen could be used just as easily. Of course the cooking time would be significantly different. Fresh tortellini would probably take 5 minutes to cook, frozen slightly longer. 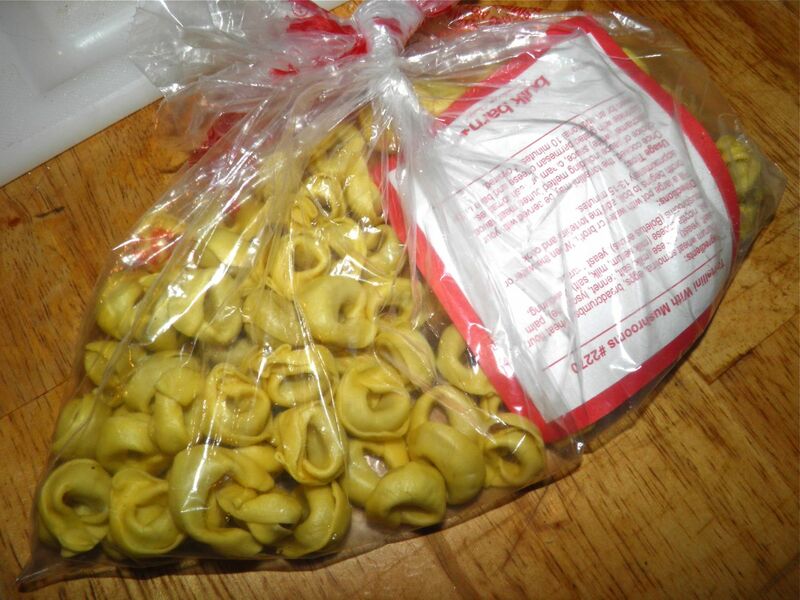 Dried tortellini can be purchased with two different fillings at our local Bulk Barns. You’ve heard me extoll Bulk Barn's virtues before – buy without packaging and save money. Locally they sell mushroom and three cheese. They also have tri-colour, if you’re in a festive mood. Bulk Barn dried mushroom tortellini. Don’t worry about purchasing dried tortellini. Manufacturers use a special drying procedure to ensure a safe product. After the tortellini are made they are steam pasteurized. Then they are dried, "stabilized," and packed. But back to the “cheap” aspect of this recipe. The tortellini cost about $2.50 for 2 cups. The canned tomato was regularly $2,00 but was on sale for half that price. Spinach was $2.99; stock – if you use cubes – about 50¢. The rest of the ingredients are maybe 75¢, except for the cheese. That’s the wild card in pricing this. Real parmesan is expensive. But, if my math is correct, the whole pot came in under $9.00. Let’s ballpark cheese at $2.00. So to feed four a healthy, satisfying dinner cost $2.75 per serving. Not too bad. Especially since a beef roast for four, alone, will usually set you back about $15. Just kidding. I use them all the time to no ill effects (…twitch). In seriousness this is a hearty, quick and cheap meal that really hits the spot. I have one substitution in mind when I am growing my own herbs next year. I want to see what this recipe would taste like if I substituted all the spinach for basil. Of course you need to grow your own to make it affordable, or wait for it to arrive at farmers’ markets. Large bunches (for pesto) usually cost $2.00 at the height of the season. I would imagine it would be a taste sensation like no other! If you do have your own basil, give it a try. Heat the oil in a large stock pot. Add the onion and garlic and sauté for about 2-3 minutes until the onion has softened somewhat and the garlic is fragrant. Add the tomatoes and their liquid plus 4 cups of the chicken stock. Bring the liquid to a simmer. Five minutes before the tortellini are done, add the spinach and submerge in the broth. 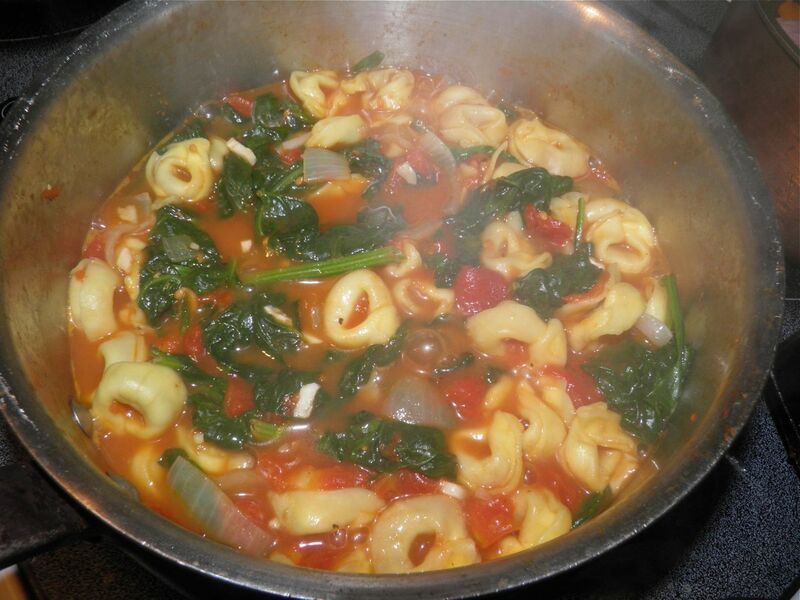 Cover the pot completely and let cook until the tortellini are done and the spinach has wilted. If you feel there is not enough liquid, add the remaining cup of broth and bering back to simmer. Taste for salt and adjust. Serve in bowls with parmesan grated on top and crusty bread on the side.